Posted by Cyril. March 14th 2014. 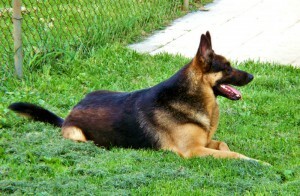 German Shepherds are one of the most handsome breeds of dog. Strong, well-proportioned and coated with thick dark fur, it is little surprise that they are so attractive to dog lovers. If German Shepherds are socialised from being puppies, they will grow up to be loyal, confident and cheerful dogs. They are serious, confident, calm and very eager to learn. This makes them ideal working dogs and one reason why they are so often employed by the police. German Shepherds will not hesitate to risk their lives for the pack and love to be near their owners. However, they are wary of strangers so must be handled carefully as they can be intimidating. A point worth keeping in mind is that German Shepherds are socially close to the people with whom they live and do not enjoy being left alone for long. Any aggression is usually down to mishandling and lack of training. This sturdy handsome dog has a muscular, slightly elongated body with a firm bone structure. Its head is in proportion to its trunk and legs, its forehead slightly rounded and its nose is usually black. Occasionally, it has a blue or liver-coloured nose which is considered an impediment for showing. Teeth are strong and sharp, the eyes are dark and ears are pointed. Depending on whether its coast is ‘plush’, ‘double’ or ‘long haired’, a German Shepherd’s colouring can be all black, black with tan or sable. Its coat can also be a combination of white, blue and liver but these combinations are not regarded as suitable for showing – although they may be desired by some owners. A German Shepherd can live for about 13 years and generally weighs 75 – 85 pounds depending on its build. Unregulated breeding has led to conditions like hip and elbow dysplasia, digestion issues, blood problems, skin conditions, bloating, epilepsy and allergies to fleas. They can also be susceptible to tumours on the spleen and pancreatic issues. 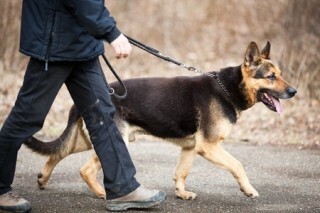 German Shepherds are very active dogs and therefore need regular exercise. 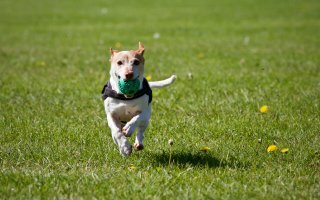 There are many ways you can exercise your dog, but certain breeds do require more exercise than others. They are best suited to larger homes with big gardens but providing they are exercised regularly they can be kept in smaller houses and flats. The perfect kind of exercise for these dogs is something that is combined with training but you can also go for a job with them or have them run alongside your bicycle to give them a more intensive workout. Advanced dog training also suits them well. Playing Frisbee in the park or on the dog beach is great fun for these energetic dogs and exercise with some sort of objective is best for a German Shepherd as they need to use their sharp minds as well as their bodies. These dogs have dense coats which need daily brushing to keep on top of shedding. This is especially the case when the weather is warm as they shed constantly in the heat. They should only be bathed when absolutely necessary because the loss of oil from their skins can cause irritation. Owners also need to check ears for any infections and have claws trimmed routinely. You can find out more about how to properly groom your dog over at our We Talk Dog blog.